Free Home Phone Using Google Voice and MagicJack : GVJack | Free Pc to Phone Calls, Free Voip Calls to India International ! Google Voice is already a very very popular voip service and the best thing about it is "Free". It is not the first time we are talking about Google Voice voip service, we have been covering it from Grandcentral times. So we can assume that many of our readers are already using Google Voice. Many of you may not be aware that you will be able to setup Google Voice service for your home phone and replace your landline phone. With Google Voice Service what you are getting is unlimited free calls to USA and Canada, unlimited free text message for USA and Canada. You can also make cheap international calls using Google Voice. But it still does replace your landline or home phone. But today we will be discussing a procedure by which you can replace your home phone completely with Google Voice. PCPhoneSoft.com has launched a new app "GVJack" and with a magicJack phone adapter (even if it is expired), you can use Google Voice as your home phone. I found this on internet "the number of expired MagicJack units alone that can be reused with the calling services from Google Voice by installing the "GVJack" App should already be well in excess of 1 million units." This number is pretty high. GVJack Features : You can reuse a MagicJack dongle for Google Voice calling even if the magicjack dongle was owned by a different person or has an expired subscription. 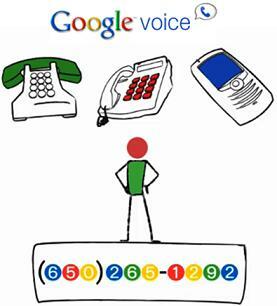 Google Voice continues to offer free phone numbers, long distance calling, texting and voice mail. The "GVJack" App is designed to be used with a physical phone and its keypad to provide a fully featured landline style calling experience. All users need to do to start making phone calls is to download and install the "GVJack" App and then plug a magicJack into a USB port on a computer and sign in using any Gmail e-mail address and password. Before we go into detail, GVJack is free for first 7 days. After that you can buy it for one time cost of $19.95. As there are other methods as well which can be used to have free home phone solution using Google Voice, so first try GVJack before buying. Now gets into the detail how can you use Google Voice as your home landline phone solution. Install the GVJackApp on your Windows XP(SP2)/Vista/7 computer (min. spec 1 Ghz CPU and 1 Gig RAM). Plug a MagicJack dongle into a USB port on your computer. Once you have signed in and the www.gmail.com website has initialized, the GVJackApp traybar icon will turn red. Your phone will also ring once to confirm that it is ready for placing calls. To sign out, right mouse click on the GVJackApp traybar icon and select "Sign In / Sign Out" from the menu that appears. Click the "Sign Out" button. To change feature settings, right mouse click on the GVJackApp traybar icon and select "Features Dashboard" from the menu that appears. You may also use the same phone with online voice/voice chat services by going offhook and waiting 5 seconds for dialtone to automatically stop. After placing at least one outgoing phone call you can sign up for an incoming phone number from Google Voice (if you are a North American user) . Right mouse click on the GVJackApp traybar icon and select "Phone Account" from the menu that appears. On the Google Voice webpage that opens follow the online instructions to sign up for a phone number. Click on the GVJackApp traybar icon again and select "Phone Account" once more. On the Google Voice webpage that opens check the box that has the words "Google Chat" and your Gmail e-mail address next to it to forward your phone number to your Gmail e-mail account. You are now set up to receive incoming phone calls. For more details on how to setup GVJack to use MagicJack and Google Voice, visit PCPhoneSoft. I had an old expired magicJack setting in my desk drawer and just downloaded and tried out GVJACK. It actually works just like you described. I also set up my Google Voice account to ring my mobile phone at the same time when somebody calls me and that is really cool. I would say that it is definitely worth checking out. GVJackApp is not free, it is free 7 days trial after that you have to pay for the GVJackApp service. Also, I don't see why anyone would use this GVJackApp to make calls with paid service. You can simply get Magicjack for $20/year with unlimited calling. That's definitely not right my friend. GVJACK uses Google Voice and it is a free calling service (http://voice.google.com) . You only have to buy the GVJACK program one time for $19.95 that lets you use Google Voice free calling service with your phone and gives you more than 20 phone features.